What is Tabbouleh? I bet most of you have no idea what I am even talking about. Well, let me tell you. Tabbouleh is a Levantine (originally from Lebanon) wheat salad. I have traveled to the middle east and have always had many friends from the region, so this is a dish I started enjoying early on. It is super simple, and the light lemony flavor is GREAT for summer time! Preheat oven to 350 degrees F. Prepare the bulgur wheat according to package directions. Add the lemon juice, 1/4 cup of olive oil, and 1.5 teaspoons of salt to the bulgur as it sits and cooks. Set aside for about an hour to let cook through. *Next, rub chicken with olive oil and sprinkle with salt and pepper. Roast in the over for 35 minutes, or until just cooked. Again, set aside and let cool off. Remove chicken meat and dice into medium pieces and add to the bulgur wheat. Then add scallions, mint, parsley, cucumber, tomatoes, 2 teaspoons of salt, and 1 teaspoon of pepper. At this point, you MUST taste the dish to see if it needs more seasoning! The most important thing when cooking is to taste your food! Make sure it is seasoned to tasted. You can either serve immediately or refrigerate and serve cold. 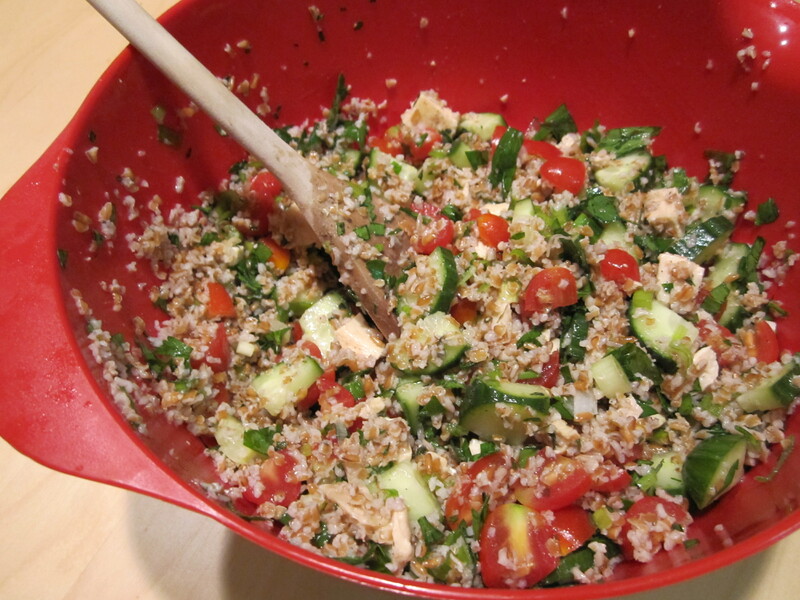 The longer the Tabbouleh mixture sits, the flavors will intensify and improve. 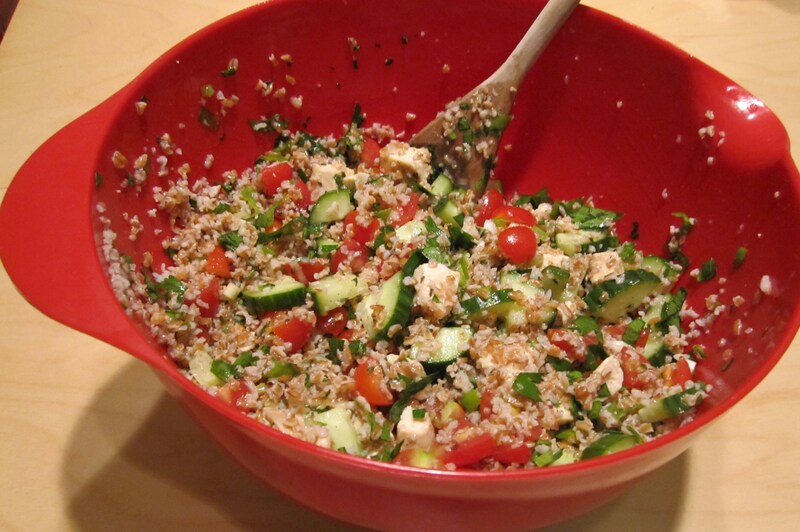 Cool, refreshing Tabbouleh can be used as a side dish or a main dish. When I know I am cooking for a vegetarian and meat eating audience, I love to use this dish! Follow the same directions, but serve the chicken or tofu on the side and allow guests to help themselves. *This step is easily replaced with Tofu! Cut extra firm tofu into cubes and sprinkle with the same seasonings. Roast in the oven until crispy and use in place of the chicken.